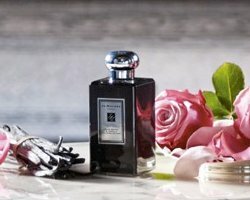 I tried Jo Malone's Rose Water & Vanilla when it was first released, but since I was under the impression that the "Cologne Intense Collection" (which included Rose Water & Vanilla) was a limited edition line, I didn't bother to review it. Now that it seems to have become part of the permanent collection, I've revisited it and I'm still intrigued. The Cologne Intense Collection is a group of "distinctive scents inspired by the rich, sensory experience of the Middle East," and Rose Water & Vanilla is inspired by "delectable Turkish Delight": "Rose Water and comforting vanilla are enriched with a succulent bite of rose loukoum. Tempting and addictive." Elsewhere, Jo Malone describes this fragrance as "an elegant powdery scent that blends spicy sweet Orange Blossoms, the richness of Vanilla and an underlying smokiness from the agarwood." I'm sure I'm not the only one who looks back with fondness on the craze for loukhoum-inspired fragrances that swept through various perfume message boards in 2004. How does Rose Water & Vanilla fit into that genre, a decade after the niche trend began? It's certainly a gourmand perfume, and as Jo Malone's descriptions promise, it is sweet and it is powdery. It's probably more dessert-like than anything that the company has previously released, and since many customers probably haven't been exposed to earlier loukhoum fragrances like Serge Lutens Rahät Loukhoum (1998!) or Montale Sweet Oriental Dream, its sugared-almond and candied-floral notes may seem new and unusual. On the other hand, Rose Water & Vanilla is more feminine than either of the fragrances I've just mentioned, and it doesn't include any hints of pipe tobacco or alcohol. Instead, just as its name suggests, it emphasizes Turkish Delight's flowery, sugary side. It starts off with a wave of orange blossom and heliotrope, followed by a clean almond (no Play-Doh here! ), some very pretty rose petals, and a smooth, aromatic note that may or may not be agarwood. (I don't even trust myself to recognize agarwood/oud anymore, since it's everywhere and nowhere at the same time.) Rose Water & Vanilla's base includes a soft, creamy almond-vanilla as well as a gentle, fuzzy musk. Did you take part in the loukhoum niche-fragrance trend of the early 2000s, and if so, are you still wearing any of your favorites? Or is the idea of a Turkish Delight perfume new to you? Either way, have you tried Rose Water & Vanilla? Please feel free to share in the comments! Jo Malone Rose Water & Vanilla is available as 100 ml ($135) Cologne Intense. For purchasing information, see the listing for Jo Malone under Perfume Houses. Oh, I want to smell this. I have been all about powdery lately, and Sweet Oriental Dream is a perfume that I like despite myself. I could see liking something a bit less in-your-face. Thanks for the review! Tama, do give it a try if you can — I’m a powder-lover, of course, but I do think this one is easier to wear than many others. I have SL Rahat as you mentioned and like to occasionally wear it when I need a sweet sugar jolt. But as much as I like it I grow bored w/ it very quickly, it just doesn’t have enough. Enough of what I can’t always say but just not enough That said, I would be interested in this if JM adds it to her bath line. This sounds marvy as a bath oil. I love the idea of a loukhoum bath oil. Or a soap. This is a JM I really want to try. I have a decant of Lutens’ Rahat Loukhoum that I really love wearing, and eventually will need a full bottle of (after Chergui and Santal Majuscule, though). Hi, Solanance — it’s not too similar to SL Rahat Loukhoum, because it doesn’t have the cherry-almond liqueur effect — but if you’re in the mood for a soft, powdery rose-almond-vanilla-musk fragrance, you’re in luck! Am I right in thinking Louvre is a turkish-delight- inspired concoction? If so it was one of my worse experiences. I like sweet, I like vanilla and I like gourmand, but that was just a horror! On the other hand, I did like this Jo Malone. In fact I like several of the cologne intense series. They have a depth that is missing in the regular range. Merlin, Louve has always felt a bit *blunt* to me — I like cherry-almond fragrances, and I like the Louve concept, but I don’t enjoy the fragrance itself! And I don’t think it has the floral-musky notes that most loukhoum fragrances have. Have you ever tried Rahat Loukhoum? This is my favorite Cologne Intense! But I wish it was sold in a smaller bottle, because no one needs 100 ml of something so intensely sweet! Ari, that is true! If they sold this one in a small bottle, like they do for most of their regular “colognes,” I might have purchased it by now! A petite black bottle would be so chic, too. Completely agree with this – I really liked Rose Water & Vanilla when I tried it, but didn’t love it enough to splurge on a huge bottle. It’s a shame that they don’t offer their “exclusive” and limited edition line in their smaller sizes! I’ve been interested in these since they were first announced. I don’t love all Jo Malone fragrances but I like Christine Nagel’s work and I’m pretty sure she’s the nose for some of the cologne intense fragrances. I have a coffret of earlier scents and hope they release another one with these fragrances. In the meantime I guess I’ll have to satisfy make do with a handful of samples from Saks if I ever manage to drag myself to the mall. Julia, That’s another good thing about Jo Malone — they can be very generous with samples, if they sense that you’re sincerely interested in the line! Vanille, I think we belong to the same “generation” of Makeup Alley! I did manage to find a KM Loukhoum sample and a Sweet Oriental Dream decant in my fragrance drawer. I used to have a full bottle of Loukhoum but I swapped it away when it was only half-empty… my tastes had changed. Now I miss it! This sounds interesting. I will try it the next time I venture out to Saks. 1. I used to love my Rahat Loukhoum (Name engraved bell jar? Yes please. :P) but its slightly too focus on the cherry. Which I find to be a fact for many Loukhoum-inspired fragrances? I am thinking of getting Traversee du Bosphore from L’artisan right now. 2. A good gourmand rose is in order! I was reading Robin’s post today and was asking about any great true-gourmand roses. Many just are not foody enough! 3. Funny how reading this post leads me to feel it smells a little along the lines of What We Do In Paris Is Secret by A Lab On Fire. I know it shouldn’t cause of the agar wood and middle-east inspiration. I guess it’s the mentioning of pastries, almonds, vanilla and powder perhaps..? As a gourmand rose, would Tocade be gourmandy enough for you? I’d also recommend Bond no. 9’s West Side, unless it’s been reformulated recently. And maybe PG’s Brulure de Rose (very sweet!). Happy888cat, I have a Rahat bell jar, too, which a traveling friend kindly brought back from Paris for me! I should wear it more often. I’m just always so afraid of spilling it! I love Traversee du Bosphore, because it has such a pretty loukhoum note combined with the leather and the fruit and the other notes. It’s really one of my favorite non-discontinued L’Artisans. I also happen to like What We Do in Paris is Secret, although I’d say it’s richer and fuller than JM Rose Water & Vanilla, and has a lot more going on. Irisfreak suggests Rose Praline (from Les Parfums Rosine) below and I have not smelled that. Recently, however, I smelled a Rosine on a cardboard strip and thought it wonderful. I thought the name was Rose Patisserie but when I looked it up at home I couldn’t find such a perfume. I think it must have been Rose Poussiere; the only one that sounds similar. In any case – the word patisserie sounded right because it smelled so much like a gourmand to me – cinnamon etc! And Jessica has a great review of it too. This was really more about vanilla than rose too me, it was too much vanilla for my tastes, a really sweet vanilla. I liked it upon very first sniff but quickly realized, the vanilla is the main player when I was wanting more rose. Just me though. It certainly is more vanilla than rose — I’m sorry if I didn’t make that clear! What do people think of JM’s osmanthus? Don’t think it’s turned up yet over here.. It didn’t exactly blow me away. I don’t know how you can improve on TDC Osmanthus or Parfums D’Empire Osmanthus Interdite. Why look anywhere else? I don’t know when it came out or whether it qualifies for this discussion, but for a gourmand rose I quite like Rose Praline at Rosine. I’ve never purchased a FB from that line, though, because I find the drydown so boring and banal. I wish they would figure that out so we’re not left with the meh for the rest of the day. I love Rosine’s Rose Praline for a spicy-cocoa rose! Good suggestion. Hi Jessica: I’m definitely very intrigued if this is akin to a lighter verion of KM Loukhoum. I love that one and think the rose note in it is amazing — but it’s an incredibly strong scent and just a drop or two is almost too much sometimes. I also enjoy Rahat, but I can see where that’s more about an almond extract type scent. Thanks for this review. It’s hard to keep up with all the JM launches in the last couple years. Hi, Joe — I don’t manage to try every single JM release, but I did like the recent Blackberry & Bay more than some others! and I definitely think of Rose Water & Vanilla as a lighter cousin of Keiko Mecheri’s Loukhoum. I’d actually be surprised if the folks at JM didn’t take KM’s fragrance as their starting point for this one! Hi, would this be appropriate for a 17 year old to wear? I’m on the lookout for a good vanilla that isn’t cloyingly sweet and has depth to it. Wearing Prada Candy at the moment and is looking forward to building my perfume collection. It would be greatly appreciated if other perfumes can be recommended. Thank you! I think it would be great on a 17 year old – but it is pricey! I agree with Merlin—someone in her late teens could wear it, although it’s not exactly cheap! Do you ever shop at sites like Luckyscent that offer sample vials? You could try a few vanilla-themed fragrances that way. Diptyque’s Eau Duelle is very nice, with some depth. Les Nereides Douceur de Vanilla is a very pretty sugar-crystal vanilla. You might also like Sarah Horowitz’s Perfect Vanilla or Perfect Bliss. There are many others out there… I’m sure we’ll get a few good suggestions! I will have to sample this. Seems positively delicious!